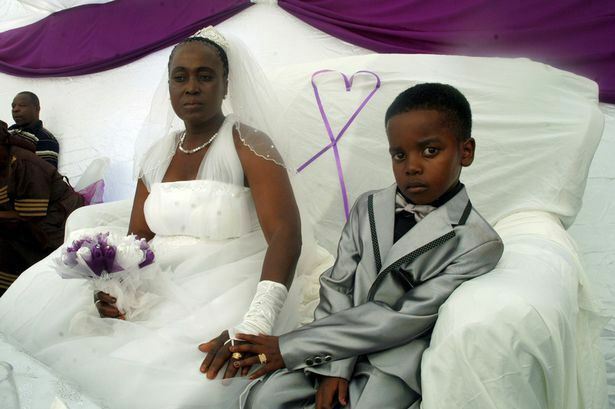 Sanele Masilela (8 years) marries Helen Shabangum (61 years) at a ceremony in Tshwane, South Africa, attended by a hundred guests. A marriage ceremony was held with great pomp and show. The marriage was celebrated with dance, expensive wedding dresses, bouquets of flowers and even there was a French kiss between the “young” husband and wife that caused some discomfort in the meeting. However, the couple did not sign a marriage certificate and the husband and wife will not share same marital home. Ms Helen Shabungum is already married and has five children. Surprisingly, this detail did not bother the 8 year old boy. “I am pleased to have married Helen,” he declared. He further explained that his dead ancestors had ordered him to marry now but when he will grow up he will marry a woman of his age.